The April 6 Youth Movement announced on Tuesday that its current leader, Amr Ali, was arrested by security forces earlier in the day. In a statement published on its official Facebook page, the political opposition movement stated that Ali was arrested in Shebin El-Kom district in Menoufeya governorate by state security. The movement added that the reasons behind his arrest are unclear. In statements to Al-Ahram's Arabic website, Khaled Ismail, a member of the movement's political office, said that Ali's brother was the one who informed the movement about the arrest. Ismail added that there was an arrest warrant issued against Ali in June after an April 6 member was arrested in Cairo for distributing flyers calling for a strike. Ali was not arrested at the time, however, and the member was released. Ismail said that Ali's recent arrest could be connected to that warrant. Ali was elected as the April 6 Youth Movement coordinator in October 2013, succeeding its founder and long-time coordinator Ahmed Maher. Maher is currently serving a three-year jail term – along with prominent activists Ahmed Douma and Mohamed Adel – on charges of holding unauthorised demonstrations and using force against the police. The April 6 Youth Movement was founded in 2008 to support protesting workers in the Nile Delta's Mahalla. 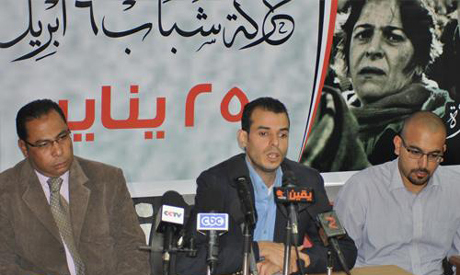 It soon developed into one of the leading opposition movements during the Mubarak era. After the ousting of president Hosni Mubarak in February 2011 , the movement continued to play a role in the political scene.